Tesla announces it officially closed the SolarCity acquisition, now what’s next? We’re pleased to announce that Tesla’s acquisition of SolarCity closed this morning. It wasn’t necessarily an easy process. Wall Street analysts almost universally didn’t like the deal and Tesla’s share price suffered the consequences, but now that it is closed, what’s next for the new combined company? The main technical development now that the merger officially closed today is that SolarCity’s stock stopped trading this morning ahead of its delisting. As for the actual changes to the business, now that Tesla is selling cars and energy, the company is operating in two different trillion-dollar industries. But what is particularly interesting with Tesla’s effort is that the company is trying to push for new synergy opportunities between the two industries in a way that was never possible between legacy automakers and the oil industry for example. 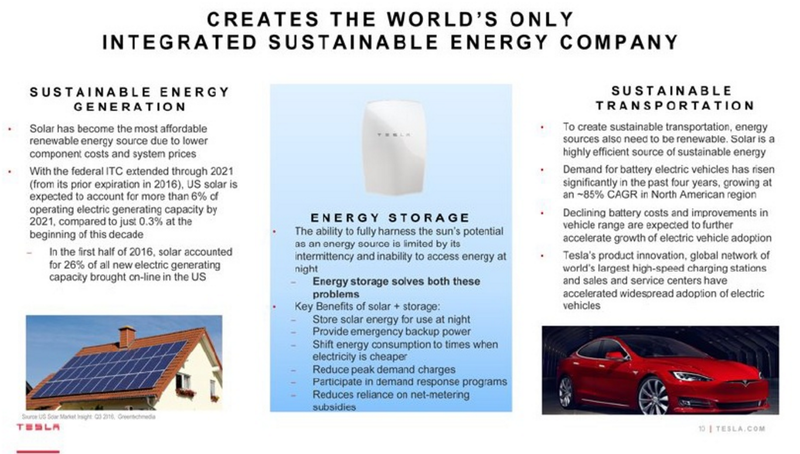 Tesla basically owns the entire cycle of energy from the generation, with solar installation, to storage, with the Powerwall or Powerpack, and finally to consumption, with Tesla’s vehicles. 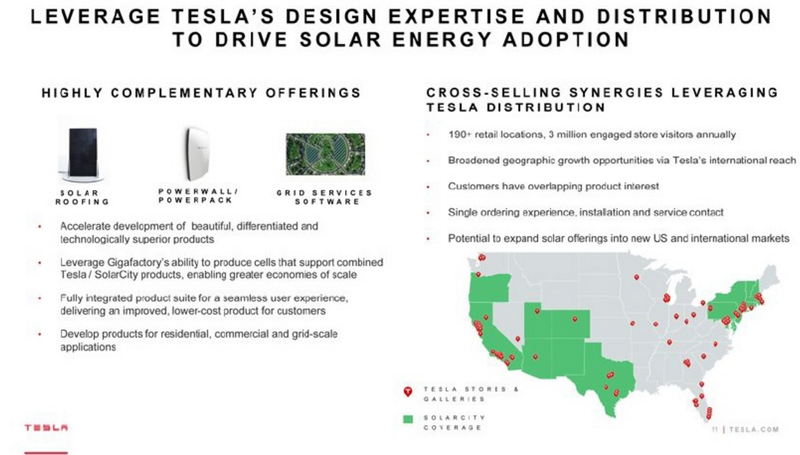 Tesla is folding SolarCity’s entire business of selling and leasing solar installations into its own business. Tesla benefits from a stronger brand recognition and reputation than SolarCity and therefore, the company plans to completely phase out SolarCity’s brand and sell solar products entirely under the Tesla, or more specifically, the ‘Tesla Energy’ brand. The company didn’t release many details about the brand transition other than it will happen over the next year. The cross-promotion and marketing opportunities are quite significant here. Imagine Tesla selling a vehicle to a customer and then offering the opportunity, if they are homeowners, to cancel out the small increase in their utility bill because of home charging through savings with a new solar installation. Of course, it highly depends on the market and the property of the new Tesla vehicle buyer, but in all states where SolarCity currently operates, there are large numbers of houses that could save money by installing solar capacity. Tesla could be offering them not only the chance to not have to pay for gas anymore, but also to virtually drive for free on sunlight when taking into accounts the savings from their previous electricity bills after a solar installation. 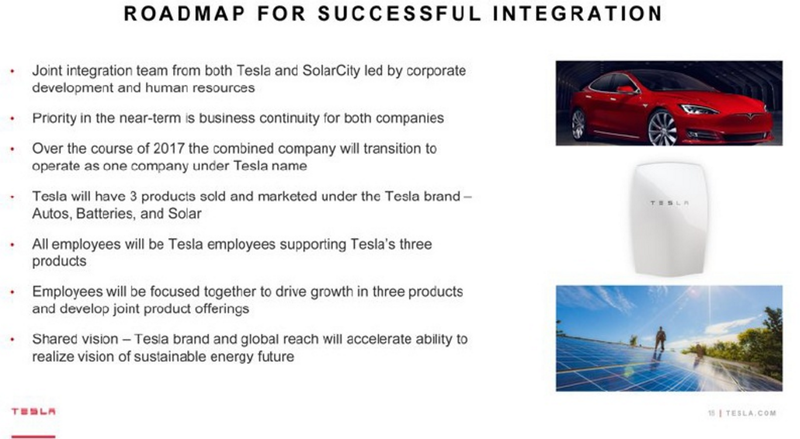 There’s also the installation process that will change now that Tesla and SolarCity have merged. SolarCity’s installers and electricians will now be trained to install solar arrays, Tesla Powerwalls, and Tesla chargers. It should offer opportunities to lower the overall installation costs and reduce delays. Of course, there are also major projects on which the companies are collaborating that should go a lot smoother now that they are officially the same. They can remove the process of independent board reviews when initiating a collaboration. Tesla and SolarCity were reportedly in talks for ‘a number of large’ utility scale energy storage installations before the acquisition. Those projects are expected to benefit from the merger. There’s also the Buffalo solar factory and the collaboration with Panasonic that was contingent on the merger going through. This project will also now move forward and Tesla will be manufacturing a combination of Panasonic and SolarCity’s solar cell and module technology.